This class is designed to handle all about a given chemical kinetic function from editing and displaying (with help of MathML) the function to calculating the function value. Definition at line 29 of file CFunction.h. Definition at line 25 of file CFunction.cpp. References CKeyFactory::add(), CCopasiRootContainer::getKeyFactory(), and CAnnotation::mKey. Referenced by createCopy(), and splitFunction(). Definition at line 38 of file CFunction.cpp. References CKeyFactory::add(), CEvaluationTree::compile(), CCopasiRootContainer::getKeyFactory(), CAnnotation::getMiriamAnnotation(), CAnnotation::mKey, and CAnnotation::setMiriamAnnotation(). Definition at line 53 of file CFunction.cpp. References CCopasiRootContainer::getKeyFactory(), CAnnotation::mKey, and CKeyFactory::remove(). Function to add the description of a variable. Definition at line 154 of file CFunction.cpp. Referenced by SBMLImporter::createCFunctionFromFunctionTree(), and CReaction::setFunctionFromExpressionTree(). Definition at line 159 of file CFunction.cpp. References CCallParameters< Type >::begin(), CEvaluationTree::calculate(), mCallParametersBegin, and CEvaluationTree::mValue. Referenced by CEvaluationNodeCall::calculate(), CReaction::calculate(), CReaction::calculatePartialDerivative(), and main(). Complete the list of evaluation tree such that all called trees are includes. Definition at line 303 of file CFunction.cpp. References C_INVALID_INDEX, CEvaluationNode::CALL, CCopasiRootContainer::getFunctionList(), CCopasiVectorN< CType >::getIndex(), CEvaluationTree::getNodeList(), and CFunctionDB::loadedFunctions(). Definition at line 428 of file CFunction.cpp. 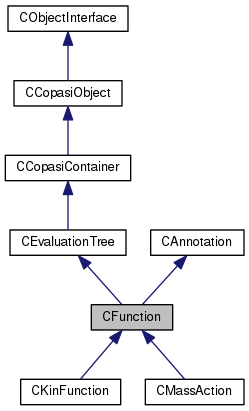 References CFunction(), CEvaluationNode::copyBranch(), CEvaluationTree::mpRoot, mReversible, and CEvaluationTree::setRoot(). Function to create a list of the names of the function parameters in MathML format. This list can be passed as the env argument to the writeMathML() method. Definition at line 340 of file CFunction.cpp. References CMathMl::fixName(), CCopasiObject::getObjectName(), getVariables(), and CFunctionParameters::size(). Definition at line 168 of file CFunction.cpp. References CCallParameters< Type >::begin(), and CCallParameters< Type >::end(). Definition at line 58 of file CFunction.cpp. Referenced by CCopasiXMLParser::FunctionElement::end(), CODEExporterC::exportSingleFunction(), SBMLImporter::importMIRIAM(), CQFunctionDM::insertRows(), CODEExporterC::KineticFunction2ODEmember(), CODEExporterC::preprocess(), CCopasiXML::saveFunctionList(), CCopasiXML::saveModel(), CODEExporterC::setExportNameOfFunction(), FunctionWidget1::slotBtnNew(), ReactionsWidget1::slotGotoFunction(), ReactionsWidget1::slotNewFunction(), and CSBMLExporter::updateMIRIAMAnnotation(). Returns a reference to the SBML Id. Definition at line 68 of file CFunction.cpp. Referenced by CSBMLExporter::collectIds(), SBMLImporter::createCFunctionFromFunctionDefinition(), SBMLImporter::createCModelFromSBMLDocument(), CCopasiXML::saveFunctionList(), CSBMLExporter::setFunctionSBMLIds(), and CEvaluationNodeCall::toAST(). Function to retrieve the index to the value of the named variable. Definition at line 133 of file CFunction.cpp. Referenced by CODEExporter::exportKineticFunction(), and CODEExporter::exportSingleFunction(). Definition at line 148 of file CFunction.cpp. Referenced by SBMLImporter::areEqualFunctions(), CFunctionAnalyzer::checkKineticFunction(), CEvaluationNodeCall::compile(), FunctionWidget1::copyFunctionContentsToFunction(), SBMLImporter::createCReactionFromReaction(), SBMLImporter::createExpressionFromFunction(), CSBMLExporter::createKineticExpression(), createListOfParametersForMathML(), CKinFunction::createParameters(), SBMLImporter::doMapping(), CCopasiXMLParser::ListOfParameterDescriptionsElement::end(), CCopasiXMLParser::FunctionElement::end(), CFunctionAnalyzer::evaluateNode(), expand_function_call(), CODEExporter::exportKineticFunction(), CODEExporterC::exportSingleFunction(), SBMLImporter::findCorrespondingFunction(), CFindDimensions::findDimensions(), FunctionWidget1::functionParametersChanged(), CReactionInterface::getDeletedParameters(), CReactionInterface::initFromReaction(), CReactionInterface::initMapping(), FunctionWidget1::loadParameterTable(), FunctionWidget1::loadUsageTable(), CCopasiXML::saveFunctionList(), SBMLImporter::setCorrectUsage(), CReaction::setFunction(), CReaction::setFunctionFromExpressionTree(), CMassAction::setInfix(), CFindDimensions::setupDimensions(), FunctionWidget1::slotTableValueChanged(), splitFunction(), CCopasiXMLParser::ParameterDescriptionElement::start(), test_compare_utilities::test_copasi_function_expansion(), test000078::test_l2v4_import_unordered_functions(), CReaction::variable2object(), CReactionInterface::writeBackToReaction(), and writeMathML(). Definition at line 151 of file CFunction.cpp. Function to retrieve the value of the indexed variable. Note this function is only usable during calcValue, since the values of the call parameters are only defined during that time. Definition at line 139 of file CFunction.cpp. Definition at line 219 of file CFunction.cpp. References CFunctionParameters::add(), C_INVALID_INDEX, CFunctionParameters::findParameterByName(), CFunctionParameter::FLOAT64, CCopasiObject::getObjectName(), CEvaluationTree::mInfix, CEvaluationTree::mpNodeList, mVariables, CFunctionParameters::remove(), CFunctionParameters::size(), CEvaluationNode::type(), CEvaluationNode::VARIABLE, and CFunctionParameter::VARIABLE. Referenced by setInfix(), and splitFunction(). Function to retrieve whether it is reversible. Definition at line 145 of file CFunction.cpp. Referenced by CMassAction::calcValue(), CFunctionAnalyzer::checkKineticFunction(), CModelAnalyzer::checkReaction(), CSBMLExporter::createKineticExpression(), CSBMLExporter::createKineticLaw(), CMassAction::dependsOn(), CODEExporter::exportKineticFunction(), isSuitable(), CODEExporterC::KineticFunction2ODEmember(), FunctionWidget1::loadFromFunction(), CCopasiXML::saveFunctionList(), FunctionWidget1::saveToFunction(), CReaction::setFunctionFromExpressionTree(), CMassAction::setInfix(), and CMassAction::writeMathML(). Definition at line 254 of file CFunction.cpp. References C_INVALID_INDEX, CFunctionParameters::getNumberOfParametersByUsage(), isReversible(), CFunctionParameters::isVector(), mVariables, CFunctionParameter::PRODUCT, CFunctionParameter::SUBSTRATE, TriTrue, TriUnspecified, and CFunctionParameter::VARIABLE. Referenced by SBMLImporter::createCReactionFromReaction(), and CFunctionDB::suitableFunctions(). Definition at line 182 of file CFunction.cpp. References C_INT32, fatalError, CReadConfig::getVariable(), mReversible, CReadConfig::SEARCH, setInfix(), CCopasiObject::setObjectName(), CEvaluationTree::setType(), and CEvaluationTree::UserDefined. Definition at line 119 of file CFunction.cpp. Function to set the infix description of the tree and compile it. Definition at line 73 of file CFunction.cpp. Referenced by CMathEventN::CTrigger::allocate(), FunctionWidget1::copyFunctionContentsToFunction(), CKinFunction::createParameters(), CCopasiXMLParser::FunctionElement::end(), SBMLImporter::importFunctionDefinitions(), CCopasiRootContainer::initializeChildren(), load(), CMassAction::setInfix(), FunctionWidget1::slotFcnDescriptionChanged(), test000058::test_bug1025_10(), test000058::test_bug1025_5(), test000059::test_unique_id_17(), test000059::test_unique_id_18(), test000059::test_unique_id_19(), test000059::test_unique_id_20(), test000059::test_unique_id_21(), and test000059::test_unique_id_21_2(). Function to set the infix description of the tree and (optionally) compile it. Definition at line 78 of file CFunction.cpp. 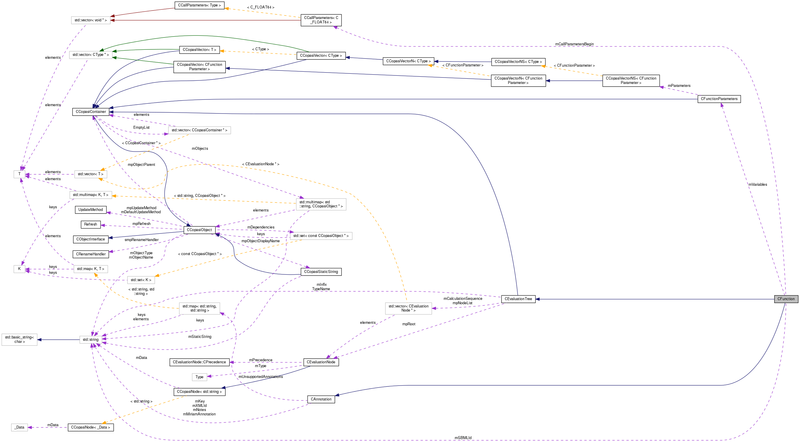 References CEvaluationNode::CALL, CEvaluationTree::compileNodes(), CEvaluationNode::DELAY, CEvaluationNodeCall::EXPRESSION, initVariables(), CEvaluationTree::mpNodeList, CEvaluationNode::OBJECT, CEvaluationTree::setInfix(), CEvaluationNode::subType(), and CEvaluationNode::type(). Function to set whether it is reversible. Definition at line 142 of file CFunction.cpp. Referenced by SBMLImporter::createCReactionFromReaction(), FunctionWidget1::saveToFunction(), CReaction::setFunctionFromExpressionTree(), CMassAction::setInfix(), and CCopasiXMLParser::FunctionElement::start(). Definition at line 63 of file CFunction.cpp. Referenced by SBMLImporter::createCFunctionFromFunctionDefinition(), SBMLImporter::createCModelFromSBMLDocument(), CSBMLExporter::setFunctionSBMLIds(), and CCopasiXMLParser::SBMLMapElement::start(). Definition at line 445 of file CFunction.cpp. References CFunction(), CEvaluationTree::compile(), CFunctionAnalyzer::constructCallParameters(), CEvaluationNode::findTopMinus(), getVariables(), initVariables(), CFunctionParameter::MODIFIER, CEvaluationTree::mpRoot, mReversible, mVariables, CFunctionParameter::PRODUCT, CCopasiObject::setObjectName(), CEvaluationTree::setRoot(), CFunctionParameters::size(), CEvaluationNode::splitBranch(), CFunctionParameter::SUBSTRATE, TriFalse, and TriTrue. Referenced by CFunctionAnalyzer::checkKineticFunction(), and CModel::convert2NonReversible(). Definition at line 389 of file CFunction.cpp. References CMathMl::fixName(), CCopasiObject::getObjectName(), getVariables(), CFunctionParameters::size(), and SPC. Referenced by CEvaluationNodeCall::getMMLString(), CQExpressionWidget::writeMathML(), and CMMLOutput::writeRHS(). Definition at line 354 of file CFunction.cpp. References CEvaluationNode::buildMMLString(), CMathMl::fixName(), CCopasiObject::getObjectName(), and CEvaluationTree::mpRoot. Definition at line 410 of file CFunction.cpp. A pointer to the call parameters during calculation. Definition at line 215 of file CFunction.h. Referenced by calcValue(), and getVariableValue(). Definition at line 220 of file CFunction.h. Referenced by createCopy(), isReversible(), load(), operator<<(), setReversible(), and splitFunction(). The id of the corresponding function in an SBML file. This value is either set upon importing an SBML file, or when the object is first exported to an SBML file. Definition at line 203 of file CFunction.h. Referenced by getSBMLId(), and setSBMLId(). The description of the variables of the function. It describes which variables need to be passed to the function for evaluation and its eventual type. Definition at line 210 of file CFunction.h. Referenced by addVariable(), getVariableIndex(), getVariables(), initVariables(), isSuitable(), operator<<(), operator==(), and splitFunction().